Rapido caravan parts online folding caravan spare wheel rim - 4.5j 13, 4 stud 130mm pdc, 85mm centre hole, 0mm offset (very rare). Have you a Rapido Folding Caravan storage wheels at all. It is like a long beam with wheels so that the caravan goes sideways on to it for less storage space taken in the garage, or know where we can plans so we can make 1. Rapido Caravan Parts are another make that is a bit thin on the ground and so we don't break them often it may well be worth bookmarking this page for any Rapido caravan spare parts you may need in the future. Looking for an Alko axle, 4 stud, 750-900KG 49" between plates, off a Rapido Orline folding caravan , can be a higher weight capacity so long as it fits. ​Searching for window for Rapido Orline. Measurements 99x63cms. Photo available. Hi there, I am after a corner leg for a Rapido folding caravan so off either a Confort, Record or Export. Thanks. Looking for a kitchen window for a Swift Challenger 480, 2007. It is light grey smoked, double glazed, 68cm wide x 33cm deep overall measured over flanged edges. I am looking for replacement support bracket (x 2) mouldings for the fold down bathroom sink in my 1993 Compass Image 360/2 2 birth caravan. Their colour is white. Can you help? Regards. 2004 Abbey Aventura 320 Caravan I'm looking for a kitchen skylight blackout blind. Can you help? Have you got a rear window and a sky light for a abi maruader 4-50 ct 1990 i think thanks. 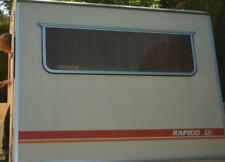 Looking for a central front window for a Bailey Beachcomber 1995. Have you anything available please? Do you have a fornt centre window for a bailey pageant 2004. Hi I require if possible a heki-2 complete unit or the Heki-2 dome and Outer bracket. If this is possible please email me. Thanks. Hi. I’m looking for some extra shelving for inside the cupboards for my 2004 sterling europa 600, the plastic type that lock into place on the back. Hi I need a elddis elusion 510/5 pull handle, the curved type, for the front of the caravan. Hi, Have you got a N/S/F window for an elddis avante 505, 2001 model, slight bronze/brown tint with Black edging. Width across is 430mm and length down the left, longest side is 855mm. Please find attached photo. Regards. Hi - I am after a small caravan to convert to a garden feature. Could you please let me know if you can help. Kind regards.